This was the first in a series of webinars organised by InformAll on topical subjects of relevance to anyone interested in information literacy. Please find here a full recording of the event, as well as a copy of the chat content. 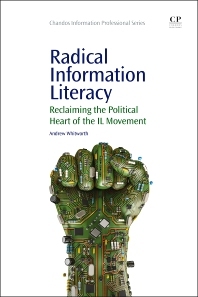 Radical Information Literacy, by Andrew Whitworth, from the University of Manchester, was published by Chandos in 2014. The book argues that the development of both the theory and practice of information literacy has been damaged by its institutionalisation in academic libraries, resulting in a neglect of more critical and relational approaches that seek to promote a redistribution of authority over information practice, rather than confirm existing authorities. A recent (Dec 2014) review in the Journal of Information Literacy called it an “important and challenging” book. The book adopts a line from the movie Ratatouille — “Anyone can cook” — to highlight the proposition that, while not everyone can become a great information literacy educator, great information literacy educators can come from anywhere. Whether inside the library sector or beyond it, in workplaces, community groups, campaigning organisations, social networks, radical IL is promoted anywhere that learners, formally or informally, are encouraged to scrutinise the cognitive authorities, information practices and criteria for value judgments that structure a particular context. Radical IL is therefore termed “the application of principles of informed, direct democracy to the scrutiny of information exchange within organisations and communities” (Whitworth 2014, p. 1). Radical Information Literacy is principally a work of theory, and there is a need to examine how the theory may be turned into practice, scrutinising its claim to constitute a resource for practitioners and other players. Faced with a range of pressures, from the increasing pragmatism of individual learners, to global changes in the political and economic climate affecting education, what can, and should, individual practitioners do to promote these ideals in particular contexts? Is it fair to criticise much existing IL practice as institutionalised? How can we “learn to see” those everyday, prosaic practices which form the seeds of a radical approach, and mesh them with the expertise of those trained teachers and organisations that have a mandate to promote effective information practice — without simply assimilating challenges to institutionalised authority and thus perpetuating the theory/practice gap? If we accept that, in principle, “anyone can cook” — that is, be an expert and effective developer of information literacy — what means exist by which such work could be recognised, promoted and encouraged? An extract from chapter 8 of the book is attached here and a presentation (from ECIL 2014) can be found here. These documents served as an introduction to the discussion. The webinar was led by Andrew Whitworth himself, and chaired by Stéphane Goldstein of the Research Information Network and co-ordinator of the InformAll initiative. Around 30 participants from across the world joined the event.